The Flyer's first Best of Memphis Readers' Poll was in 1994. Back then, the ballot had 72 categories. Now that number is 125. And while 2009's Best Of is a different beast than '94 (we've long since ditched "Favorite Airline," for example), there is something familiar. Le Chardonnay, "Best Wine List"
Charles Vergos' Rendezvous, "Best Ribs"
Molly's La Casita, "Best Margarita"
Joe Birch, "Best News Anchor"
Oak Court, "Best Shopping Mall"
Babcock Gifts, "Best Gift Shop"
Mednikow, "Best Local Fine Jewelry Store"
You may see this dozen as a sign of Memphians' fierce loyalty or of being stuck in a rut or both. Whatever. They are still the best. As always, those winners marked with a bold BOM are this year's Best of the Best of Memphis winners, meaning they won their categories with a large majority of the vote. 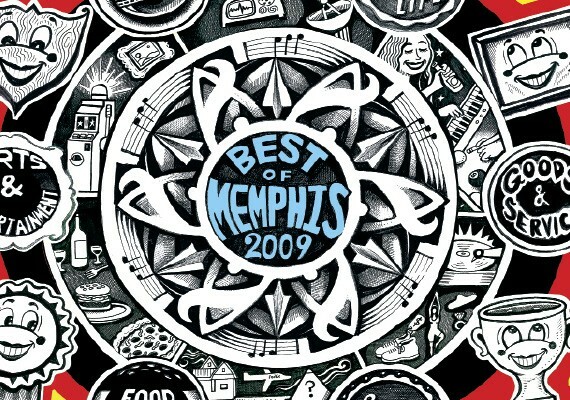 The Best of Memphis issue was written by Greg Akers, John Branston, Mary Cashiola, Chris Davis, Susan Ellis, Michael Finger, Leonard Gill, Chris Herrington, Bianca Phillips, Hannah Sayle, Bruce VanWyngarden, and Erica Walters. It was designed by Carrie Beasley.